A stream of eager high school reporters filed onto Stanford’s campus on Sunday, June 28 for one week with Newsroom by the Bay. After getting situated in their dorm rooms and learning the ropes at orientation, students had to opportunity to meet their reporting group at the opening barbecue at Stanford’s Bechtel International Center. After spending their first night at Stanford, journalists headed to their first class sessions. Some 77 students filtered through classes focused on crafting news angles, photography, and reporting with video. Year Two students, however, learned about storytelling, maneuvering through WordPress, and using design thinking to create a plan for their websites and blogs. Since then, students have met several more times with their teams to determine what their journalistic focus for the week will be. While Year One students have been focusing on the central theme that will hold their final website project together, Year Two pupils sculpted their game plan for their field trips which will take place on Tuesday and Wednesday. Each day after morning classes, students have had the option to engage in afternoon activities. A particularly special event that reporters had the opportunity to attend Monday was a meeting with Vietnamese journalists at Stanford, who were on a trip sponsored by the International Center For Journalists (ICFJ). Year One student Gillian Schumaker, who spoke with the Vietnamese reporters, explained her surprise at the freedom of speech that the journalists said they have as reporters in Vietnam. Year One student Katie Leslie learned that Vietnam is working on improving its international profile and boosting its tourism industry. 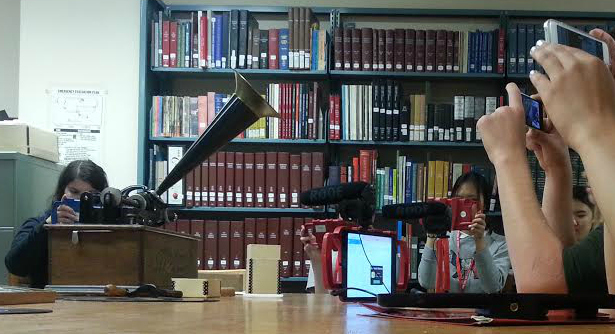 Meanwhile, other students signed up to pay a visit to Stanford’s Archive of Recorded Sound, a collection of 350,000 recordings, 5,000 film and video sources, and 6,000 print and manuscript items. music and recordings dating back to the late 1800s. There, attendees were shown some of the original forms of musical recordings and taught their history. Year Two student Emily Ducker, who went to the music archive, was particularly intrigued by the vast collection of historical recording tools held on campus. Stay tuned for more coverage of Newsroom’s 2015 field trips, including visits this week by Year Two students to the Internet Archive, Issuu, Surveymonkey, and the Year One field trip to San Francisco.